Last Fall, we had the opportunity to attend Adobe Max. A highlight of the con was the “Adobe MAX Sneaks” session giving us peek at the future. One of the most exciting things was an animation application that will run within After Effects and key on your facial expressions and speech using you computer’s camera and microphone. They call it “Adobe Character Animator”. I personally can’t wait to start playing with this. The good news I don’t have to and neither do you. Adobe is looking for feedback for Character Animator, so if you’re a member of Creative Cloud it will soon be part of After Effects. Prefab characters are available, however, Adobe will also provide Photoshop and Illustrator templates you can use to create your own animations. Check out the video below to see exactly how it works. Bring 2D characters to life by acting out your character’s movement in front of a webcam. Adobe Character Animator tracks your facial movements, lets you record dialogue or a voice performance, and enables you to trigger actions with your keyboard that give life to characters you create in Illustrator CC or Photoshop CC. When you talk, your character talks. When you feign surprise, so does your character. When you smile, your character smiles back at you. The workflow starts by creating your character in Illustrator or Photoshop. Build your character from scratch or import artwork such as eyes, mustaches, and limbs via Creative Cloud Market. If the layers are named to indicate which body part they correspond to (chest, head, eyes, mouth), then there’s no further rigging required when you import your character into Character Animator. You can immediately control your character with your face when positioning yourself in front of your webcam. Any character artwork changes you’d like to make can be edited in Photoshop or Illustrator and will automatically update in Character Animator. Use your webcam to track your facial expressions to control the position, scale and rotation of your character’s facial features such as mouth movement and eyebrow raising. Whether you’re expressing happiness or surprise, the Face tracker captures your emotion and reflects it on your character. Make your character wave or perform other movements with your mouse. Character Animator will rig your character’s facial features automatically while your mouse controls other areas of the body. Additional behaviors can be added such as making your character’s jaw and mouth slide vertically—similar to the movement of a ventriloquist’s puppet—or continuously perform repetitive actions. Simply talk into your microphone while recording in front of your webcam and give a voice to your character. Create Physics-Based Animations Characters become more lifelike when areas of the body react to their surroundings. Character Animator offers the Dangle behavior which gives your character swaying or hanging characteristics. For example, when applied, your character’s long hair will sway left to right as she shakes her head or her earrings spring up and down as she nods her head. Additional animations can be applied when using particles such as falling snow or blowing bubbles. Automate breathing and other behaviors with settings that control character attributes such as how much or how frequently a character’s chest expands. Restrict movement to specify which parts of your character move and which stay fixed in place such as keeping your character’s torso stationary while allowing the arms and head to move. Record and trim multiple takes Record multiple performances of a character, with each performance represented as a separate track in the Timeline panel. Trim and slip tracks to assemble the best performance of your character and export to Adobe After Effects CC for further refinement, Adobe Premiere Pro CC to include into a sequence, or Adobe Media Encoder CC for final delivery. Adobe Character Animator is a new application that will install with After Effects CC. This initial release of Character Animator is a preview, meaning they are still developing the application but it’s ready for you to create and animate characters. Adobe plans to co-develop the product with your input. 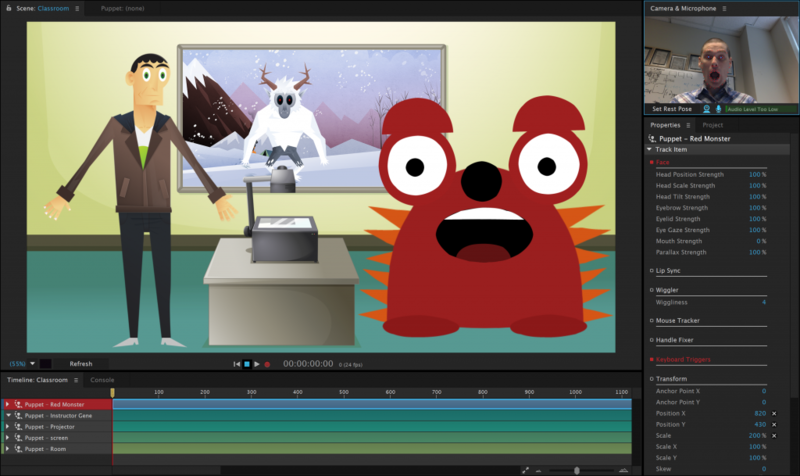 For more information about Character Animator or any of the other great products from Adobe, go to their website at Adobe.com or visit them at the 2015 NAB Show at booth SL5110.